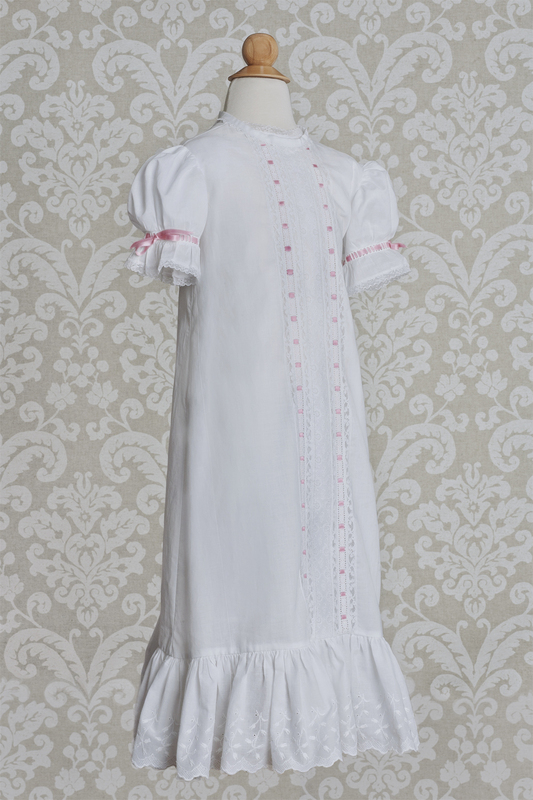 This beautiful dress and slip have just the perfect touch for your little one, as a special day-gown or girl’s christening gown. The cotton batiste gown is accented with an heirloom fancy band cascading down the front, ending in a deep embroidered ruffled hem. 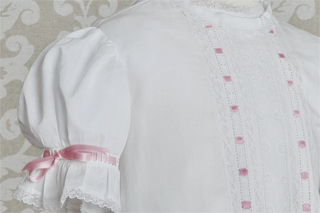 The puffed sleeves are finished with beading lace, edge trim and pink silk ribbons that match the pink ribbons woven in the front panel. 100% cotton batiste – Hand wash in lukewarm water, with a soft detergent. Air Dry. May be pressed with steam iron on wool setting. 100% linen – Dry clean or hand wash in cool water, with a soft detergent. Place pressing cloth over embroidered areas and lightly steam press until flat and smooth. Continue with the remainder of the gown.